HÀ NỘI — Hoàng Anh Gia Lai (HAGL) will have to do without star man Rimario Gordon against HCM City in the 11th round of V.League 1 tomorrow. Jamaican striker Gordon has been suspended for receiving three yellow cards. The 23-year-old striker’s absence will be a loss for HAGL up front. Gordon has scored two goals in this year’s season for HAGL in the National Cup and has been a key factor in HAGL’s rise to fourth in the league table. Alongside Gordon, midfielder Quế Ngọc Hải of Sông Lam Nghệ An (SLNA) and Võ Út Cường of Cần Thơ have also been suspended for the same reason. 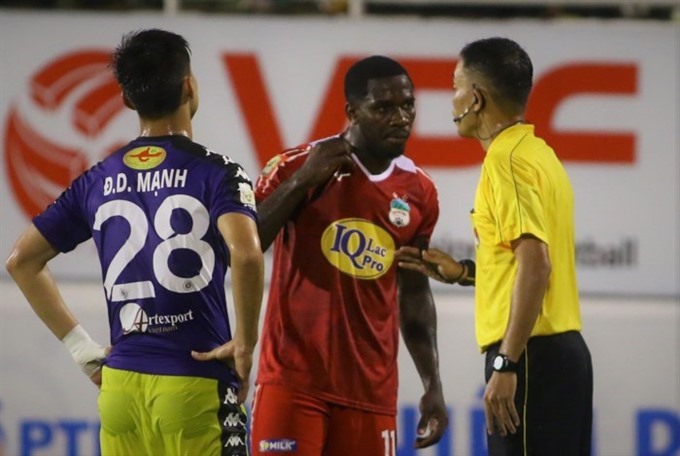 Meanwhile, striker Ganiyu Bolayi Oseni of Hà Nội FC has been suspended two matches for elbowing defender Mạnh Hùng of SLNA in the 10th round on May 30 at Vinh Stadium. As a result, Oseni can’t compete for top team Hà Nội in the match with Khánh Hòa on June 3 and Quảng Nam on June 9. The Nigerian striker is the top scorer of league now with 12 goals after 10 matches.